Today I am reviewing the NIV Integrated Study Bible from Zondervan. This is not your average study Bible. In fact, this really isn't a Study Bible in the same sense that most Bibles which are labeled as 'Study Bibles' are. This Bible doesn't really have any extra notes or commentary, but it puts the Bible in Chronological order, and when there are multiple accounts of the same passage, they are put side-by-side in parallel. There is also a handy timeline along the bottom of each page which allows you to keep track of where you are chronologically in the Bible's history. If you have ever seen a "Harmony of the Gospels", picture that, but for the entire Bible, and you have the NIV Integrated Study Bible. Although I'm generally not a fan of the updated NIV (2011), I was interested in this Bible because of the the uniqueness of it's layout. It is not a Bible that one would use for general reading, reflection or memorization. It's a reference book, and for that the translation doesn't matter so much (at least not to me). I have an old NIV Harmony of the Gospels that I have found immensely helpful and as I mentioned above, this takes that concept and extends it through the entire Bible. This is a great resource for getting the "big picture" of the storyline(s) within the Bible. I will reiterate, that this is not a Bible that you would likely use for your daily devotions (unless you wanted to simply read cover to cover in this format, which could be interesting). This is also not a Bible you'd want to take to Church or to meet with your small group (unless you were using it as a supplementary tool for teaching). It is a resource, and a very good one. I'm afraid the name would perhaps be a little misleading if someone purchased it sight-unseen as it's not what you'd traditionally expect from a Study Bible (not even a Chronological Study Bible). I do recommend this Bible for what it is, and that is a very handy, harmonious setting of the Bible in chronological order. 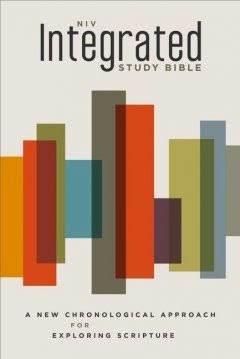 NIV Integrated Study Bible from Extra Credit Projects on Vimeo. I was given this Bible for free by the publisher in exchange for my review. I was not required to give a positive review, and these are my own thoughts.